We’ve been in the talent business since 1980 and we are a licensed, bonded, and insured agency. Our Services include, but are not limited to: Pro Music, Entertainment, Special Events, and Talent Booking. Our services can include sound, lighting, and production assistance for venues, company banquets, corporate parties, weddings, conventions, and other special events. The bands, performers, speakers, and entertainers that we represent are top-notch, just like our name. It takes experience and time to find the right potential entertainers and speakers that would fit your event and your venue. We’ve done the work for you in research, performance history, referrals, agreements, details, and contracts. Our extensive client database includes many well known business entities, high-profile organizations, charitable foundations, and fundraising associations. We believe in establishing lasting relationships. Top-Notch Talent has spent years cultivating an enviable roster of the finest quality acts available to fulfill any and every entertainment need that an event planner may envision. Our roster includes professional musicians, comedians, and performers – choose from our family friendly talent or one of our more edgier acts. Our entertainers and musicians will happily work with you to make sure you get the performance you want. We want your event to be a very successful one. We have set high standards for the talent that we choose to represent and we provide an incredible variety of entertainment acts throughout California and the United States. 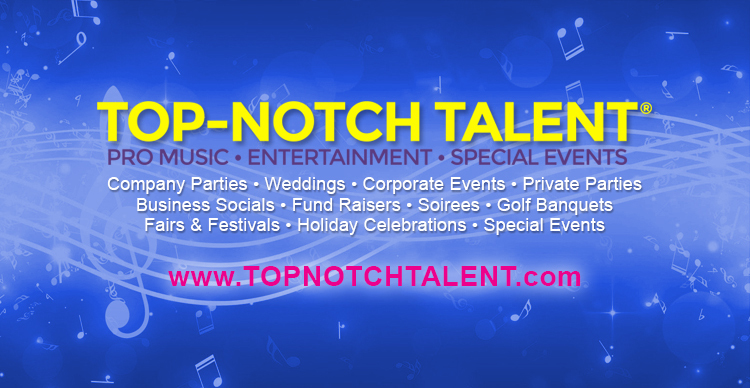 Kelly Allred, Owner and Talent Representative of Top-Notch Talent, has the know-how to help you with placing the most appropriate talent package available at your event for a perfect fit! All negotiating, the details, and the tough questions will be clearly communicated for you. We also think of the ancillary needs or any potential issues that you might not even think of. Expectations are managed to ensure an overall pleasant experience for all participants along with a seamless event timeline leading to an exceptional event outcome! With an eye for detail and a readiness for any possible contingency, Top-Notch Talent is here for YOU… that’s what we do!